Even though I have already decorated for Christmas, fall is still upon us and it’s the perfect time to indulge in homemade chili. 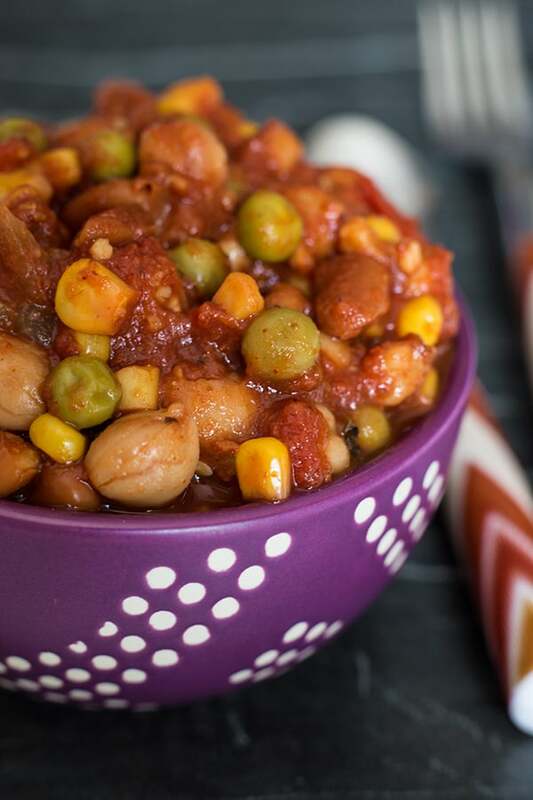 I feel like chili is a more of a fall dish, but I make it all year because it’s SO easy. I just throw all these ingredients in the crock pot and let it be. Not to mention, this chili has totally been hitting the spot during my pregnancy! It’s full of flavor and I feel good about eating it. Lots of protein and fiber for the ‘lil tot and I! (Only 3 weeks left to go)! The two star ingredients I use in this recipe are fire-roasted tomatoes and smoked paprika. These are two ingredients that I ALWAYS have in my pantry. I use fire roasted tomatoes as a base in all kinds of veggie soups, and smoked paprika is a staple spice I keep on hand to make anything smoky flavored (and it’s great in “cheesy” sauces)! What I like most about this recipe is that you basically cannot mess it up! Don’t have mixed veggies? No prob, pick and choose which veggies you want to add! Same goes for the mushrooms and bell peppers, you can always replace it with another type of veggie that you prefer. Why not throw some leafy greens in the crock pot too? FYI, on Snapchat yesterday I used my Instant Pot for the first time, which is like a cross between a crock pot + pressure cooker + steamer + oven… and I cooked soup in 2 minutes! (not exaggerating) Anyways, this recipe can also be cooked in an Instant Pot. Yum! I didn’t know you posted recipes too! Browsing your site and thinking – could you be any cuter? !